OTTAWA—As the Canadian economy underperforms that of its neighbour to the south, the divergence in action from the two central banks begins to unfold. The Bank of Canada held its overnight rate target at 0.50 percent on Dec. 7, as was widely expected. All signs point to the U.S. Federal Reserve raising rates next week. At the start of 2016, the Fed had just raised its key policy rate for the first time in nearly a decade, while the Canadian economy struggled with US$30 oil. 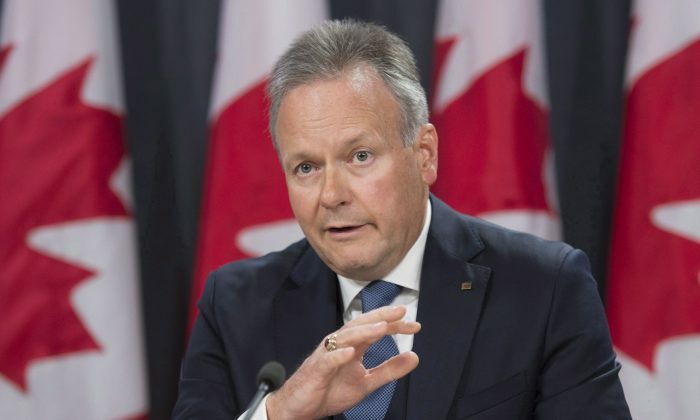 BoC governor Stephen Poloz reiterated in a speech in Toronto on Nov. 28 that, while low oil prices are positive for the U.S. economy, they’re negative for the Canadian economy. The divergence in monetary policy between the two economies looked set to play out over 2016. But that didn’t happen as the Fed dialled back its desire to raise rates due to international risks and the U.S. economy hit a speed bump in the first half of the year. The Canadian economy swooned in the second quarter after the devastating wildfires in Alberta shut down energy production. Business investment and non-energy goods exports continue to disappoint. In the third quarter, both economies played catch-up. The Canadian economy grew 3.5 percent, while the U.S. economy grew 3.2 percent. While both the Canadian and U.S. economies rebounded in the third quarter as inflation continued to lag, the labour market became the biggest discrepancy between the two economies. The United States, with the unemployment rate at 4.6 percent and wage growth at 2.5 percent, is outperforming Canada big time. “There have been ongoing gains in employment, but a significant amount of slack remains in Canada,” said the BoC. The job gains in Canada have been of the part-time variety, while full-time jobs have been declining. Canadian unemployment sits at 6.8 percent and wage growth is a paltry 1.5 percent. Alberta’s unemployment rate at 9.0 percent is the highest since 1994. “The data in Canada has signalled to me that the labour market is a bit weaker, honestly,” said Oren Klachkin of Oxford Economics in a phone interview with Epoch Times. Bond yields have shot up since the U.S. election partly due to an expectation of increased government spending in an economy that is near full capacity, said the BoC. As of the close of business on Dec. 7, the U.S. 10-year bond yield is up 0.48 percent since Nov. 8—before the result of the U.S. election. The Canadian 10-year bond yield is higher by 0.32 percent. With higher bond yields come higher mortgage rates and a potential slowing of housing demand. TD has raised the rate on its five-year fixed-rate mortgage by 0.25 percent to 2.84 percent since the U.S. election; BMO has moved by 0.20 percent to 2.79 percent. Spending on housing, which has been a major contributor to Canada’s economic growth since the financial crisis, will additionally be tempered by the federal government’s stricter mortgage qualification rules announced in October. But Klachkin said the divergence in monetary policy is going to be fairly small. “I don’t see it having a major impact on Canada in driving another hurdle to work against and further drag down 2017,” he said. “The risks to the outlook are elevated given developments outside Canada’s borders,” said RBC Deputy Chief Economist Dawn Desjardins in a note. She said the risks “cut both ways” with improving U.S. growth opening the door for more demand for Canadian exports. However, there are concerns about rising protectionist policies clipping any upside. In October when it published its most recent economic projections, the Bank of Canada said the rebound in exports in July and August was not enough to offset the weakness from the first half of the year. The latest trade data showed a small pickup in exports in October after an even smaller increase in September. “Business investment and non-energy goods exports continue to disappoint,” said the Bank of Canada.